We all had already: to do tons of stuff, but distracted, grumbling, hesitant, unable to get things done. Are you tired of wasting time? are you do that, too? Early in the morning sitting at a desk till the evening and have the feeling that nothing had actually done? Not even eat properly and the break was not enough. That can be quite frustrating and drive motivation into the cellar. But think nothing, because not only you are so. 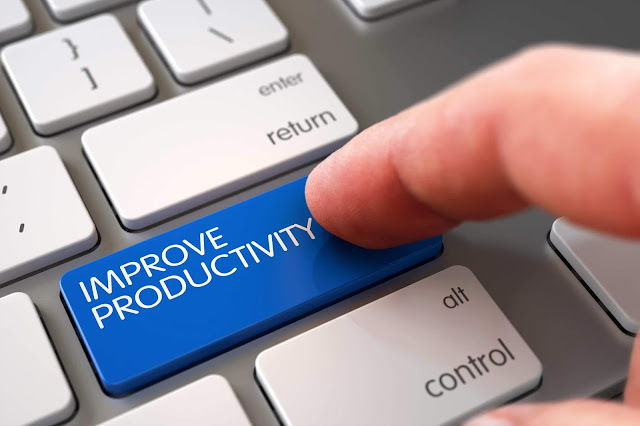 There are a few simple tricks on how to increase your productivity. I want to introduce you here. Just try it and you'll see that you can really boost your workflow. We all love our PC and our smartphone. Without these devices, you can not imagine a life anymore. Always informed about the latest news, always up to date. But this is also a big problem. You will be informed immediately by e-mail, message via WhatsApp or any other messenger. And with every message, you are distracted from your work. You were just so focused. Now you have to concentrate again, to recapture your thoughts. And over a whole day, that can cost a hell of a lot of time, and you can lose valuable ideas. So what to do? Very easily. Just turn off all your notifications. That's enough if you activate the mute function. You'll see. Under deadline pressure, you often bring the best services. If you know that something has to be done tomorrow, then you focus more on your work and work much more focused. So start setting deadlines for yourself. So you learn to prioritize your tasks and get the important things done first. Sure, there will be days when they can not do it all, but often good 80 percent are already enough. Printing is often good, and setting deadlines for yourself will increase your productivity significantly. Do you know the 2-minute rule? No? This rule states that everything you can do in two minutes should be done by you immediately. You prevent it so that you push these tasks in front of you and from all these small tasks is suddenly a real big mountain and then to work it off then really costs you a lot of time. What about you at work? total chaos and confusion? Others think for sure, but from your view is hardworking. Everywhere papers, notes, and documents. But for you, this mess is very bad. Chaos on the desk is usually a clear sign of poor productivity. Yes, actually even worse, because you will be more distracted from this disorder than you would like. You constantly have this chaos in view, you are unfocused and above all, the motivation is lost? Why? Because you're constantly being reminded of what else you have to do and wondering when you should do it all. So, start cleaning up. Set priorities and on the desk comes only what needs to be done first. You will not be able to work eight or more hours full of concentration. This is simply the case with us, that we are only able to do so for a certain time. Thereafter, the body demands a mental break. Forget about powering through as many hours as possible. This does not help, because, first, it hurts the effectiveness and the end result leaves much to be desired. It is much better if you lay out several work sprints throughout the day. So just work for a certain amount of energy and power and then take a little break again. If you have to torture yourself for a long time at work, you will not really be able to do much. Just give it a try and you'll see how well it works. Forget abot the multitasking very quickly. It just does not work. Always do one after the other. If you're constantly churning between several things, more goes wrong than you like. Your concentration is just not what it should be to do a good job. Therefore, just do one by one and focus on this one task. And when you have done that, you go to the next one with full concentration. Do you know the problem as well? Many tasks are waiting for you, but you do not know what to do with. Almost everyone goes so much that he almost gets a little bit scared of difficult and complex tasks. But you have to approach it differently. Imagine a complex task. Then you quickly realize that this indeed consists of several subtasks. And that's where you have to start. First, disassemble these complex works into individual areas. You'll see that you can do those subtasks much faster and easier. You can concentrate better and work much more focused. A working day can demand a lot. Normally, such a working day will consist of different tasks or work for you as well. We have routine tasks to do, there are emails to read and answer, and of course, the heavy and complex tasks are also waiting. Tasks in which your creativity is required. You should always divide these difficult and complex tasks for the morning. Creativity can then be saved for the afternoon. If you do this, you'll quickly notice how you can significantly increase your productivity in a short amount of time. Surely you are like many others, Unpleasant things are often postponed. But this task, which is still waiting for you, is always in your head and thoughts. This suffers from your concentration on the other tasks. That puts you in the way of your own productivity. At first, get rid of the unpleasant and get your head free for all other activities and tackle them much more focused. You sure have enough to do. It's Bad if then constantly others still want something from you. You have to change that. Again, you have to learn to set priorities and, above all, say no, or at least say that now is unfavorable time. Otherwise, you will be constantly overloaded, your productivity will suffer and your work will pile up more and more.